For 142 years, Eastern State Penitentiary stood as a stark citadel exacting payment for the wages of sin. Originally designed more for penitence than punishment, the penitentiary would come to hold some 75,000 inmates. Eastern State was closed in 1971 and barely survived the scare of being turned into a shopping mall. Today, the structure is a decaying edifice which houses a small museum. It also hosts daylight tours, special events, and fascinating art exhibits. And the annual haunted house. 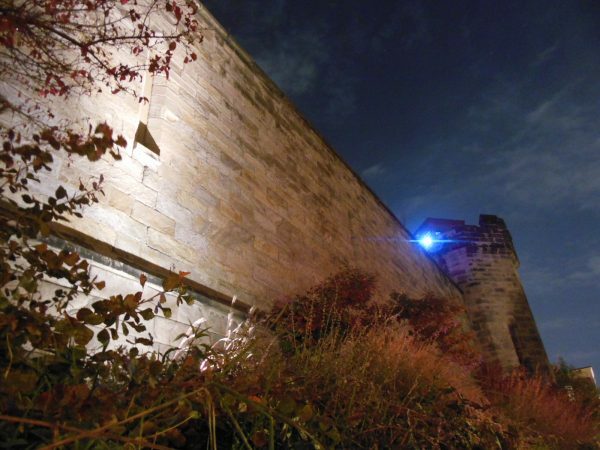 Aptly named, Terror Behind the Walls (TBTW), Eastern State is transformed every Halloween into an eight-week long horror attraction. Many believe the place is haunted. As early as the 1940s, officers and inmates reported mysterious visions and eerie experiences in the ancient institution. 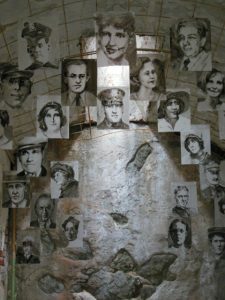 Already unique because of its architecture and history, Eastern State also features a cell filled with pictures of people killed by inmates who were once incarcerated there. If the place isn’t haunted, it is missing a golden opportunity. “Each year, we have well over 100,000 visitors. Sixty-five percent of the museum’s operating cost comes from money raised by the Halloween attraction,” said Amy Hollaman, Creative Director of TBTW. 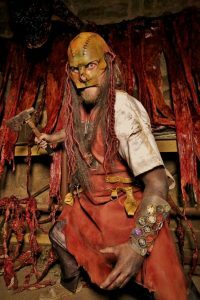 Hollaman told us that, while TBTW is in its 27th season, the attractions within the haunt are far from static. “Every year we build a brand new attraction. That means we will demolish one of the mazes and replace it. The nature of building these sort of attractions inside a national historic landmark means we cannot alter the building. Anything we do must be custom designed and press-fit, so if it needs to be removed, we can do it without damage to the original structure. Most of what you see inside is the original building. Otherwise, we use drop down walls to make the scares more effective. “Like any major attraction, we track our numbers very closely. We do surveys and focus groups to see what is working and where we can do better. We’re the largest haunted house in the country, outside of major theme parks, so we have to have high-quality metrics. Our most popular attraction is the black light attraction. We have ‘Quarantine’ in 4D now, and that stands out to most people – I guess because it is so colorful. As we negotiated the waiting areas, it became clear TBTW has a global fan base. Dozens had driven up from Baltimore to take in the scares on a Sunday night. But there were others, from as far away as Germany and Japan. Hollaman said some visitors return every year. A handful come more than once during the same season because every show is a little bit different. “One thing I can say about upcoming events is: We hope to increase the interaction. This year’s new attraction we called the Blood Yard, which is a post-apocalyptic cannibal attraction. It’s a bit gorier than attractions we have done in the past, but we like to push the envelope. So, is it really all that scary? Not if you’re a reporter who covered the Baltimore riots. However, as Hollaman said, the attractions are replete with enough scares to frighten most visitors. More importantly, the entire affair is fun. The actors are energetic, props and sets are realistic, and everyone we encountered was into their role. As for the horror attractions, stand-outs included the Machine Shop, the Infirmary, and Quarantine 4D. My friend Meg and I both opted for the interactive red-glow necklaces. And while the sum total of my interactions consisted of shouts in my ear, a few gentle shoves, two hypodermic “shots” in the infirmary and the creative application of a bleeding scar on my cheek, Meg’s experience included all of the above plus detours through hidden passageways, psychedelic halls, and creepy tunnels. She crawled under one obstacle and over some others en route to being “sacrificed” to a demonic deity. Even so, Meg got a few nice pictures. We thoroughly enjoyed our hour-long journey through the horror attractions, and were set to repair to a local sandwich shop, when Hollaman asked if we’d had a chance to visit Al Capone’s Speakeasy. Capone was perhaps the most famous criminal ever incarcerated at Eastern State. 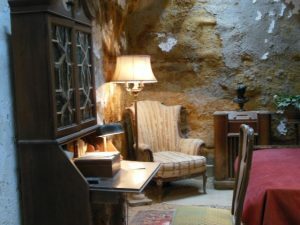 Legend has it that his cell was furnished with many creature comforts, including a wing chair, desk, and radio. The chance to check out his swinging cell block was enticing, so we were ushered into a ghost-filled nightclub. It seemed like an odd juxtaposition, going from the screams of countless zombies to the sounds of Helen Kane, but it all worked rather nicely. Flapper-clad canaries crooned jazz-age standards, while side-show specialists entertained the crowd. Creative cocktails were available for those who wished to imbibe, and for an extra cost, drinks were served in reasonably “comfy” cells. We ended the night with a tarot card reading by an intuitive named Lucian. Nevermind covering the Baltimore riots. After my reading, I’ll be looking over my shoulder for much of the next year. Terror Behind the Walls continues this weekend, with a twist. A “Lights Out Remix” takes place on the final two show nights of the 2017 season. These are different shows than the 30 before them, in that all six attractions that comprise Terror Behind the Walls will be open and fully staffed, but visitors will experience them in complete darkness. With the light from just a single glowstick leading the way, visitors will be left to find their way out of the pitch-black, narrow back hallways of the 10-acre penitentiary. Eastern State is creepy enough during the day. We can’t imagine negotiating those grounds in the dark.